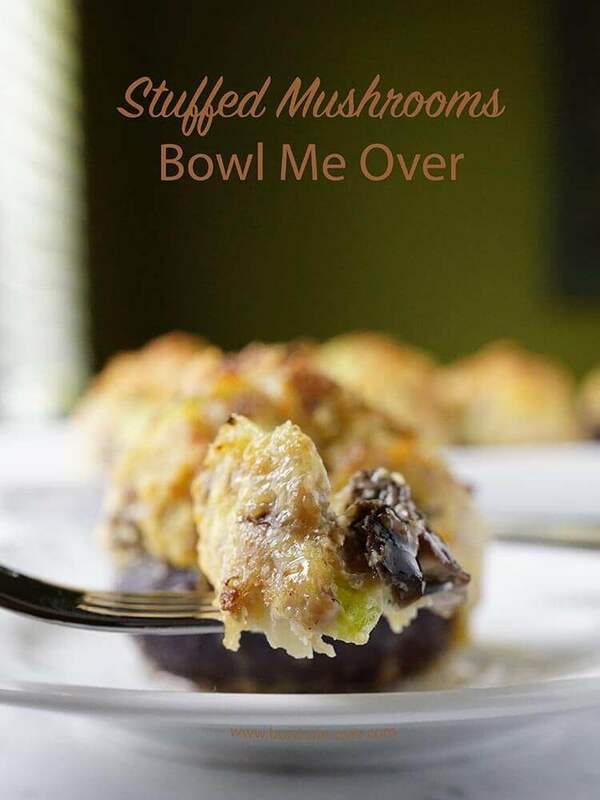 Golden brown and savory these baked stuffed mushrooms are an easy recipe and so delicious! Delectable, creamy and a little bit spicy these mushrooms are mouthwatering and loaded with flavor! Stuffed mushrooms can be used as an appetizer or main course! My Mom and I have never met a Baked Sausage Stuffed Mushrooms we didn’t love! I’m sharing this recipe with my Mom in mind. Mom loves mushrooms. Sautéed, stuffed, mushroom soup or in a salad – doesn’t matter, I think mushrooms are her very favorite food! 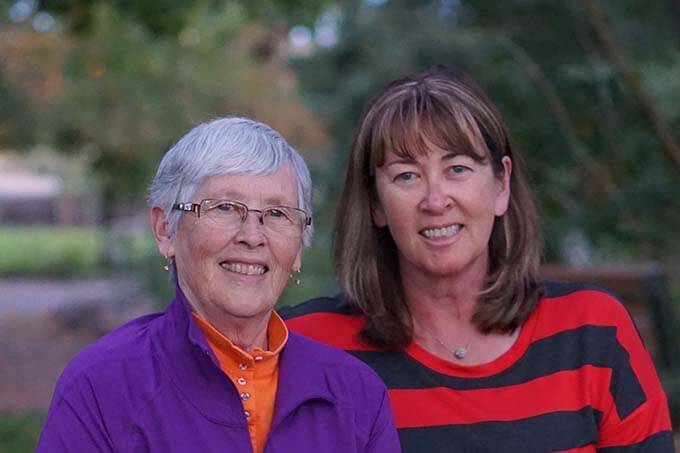 Mom is also my best friend – we giggle and laugh, collaborate and commiserate. She has been strength when I need it and tough when it’s time to dry those tears and move forward. Family is everything, don’t you agree? Anyway, let’s get back to these mushrooms. Mom will love them. They are fabulous! 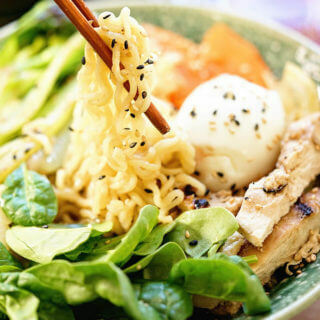 Savory, creamy and a tiny bit spicy. I will make them when they visit next – Mom will be happy I’m sure! Baked Stuffed Mushrooms are a great appetizer or a delicious side dish. What’s your favorite way to enjoy them? Start by cleaning the mushrooms. Take a damp paper towel and gently wipe the outside of the mushroom. Slice off the tip of the stem. Removing the remaining part of the stem to use in the filling. 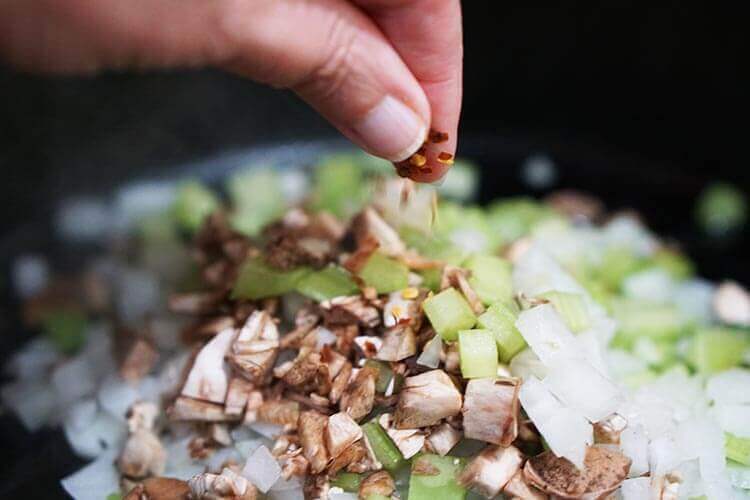 Dice an onion, celery and the stems of the mushroom, mince some garlic and into the skillet it goes with a few spices for just five minutes. Take it off the heat and allow it to cool. Adding the spices to the vegetables while cooking adds layers of flavor. Stuff the mushrooms and bake them in the oven. Finishing them under the broiler will brown the cheese. After stuffing the mushrooms with the filling, bake in a preheated 350 degree oven for 35 minutes. Finishing the stuffed mushrooms under the broiler will toast them to golden brown perfection. 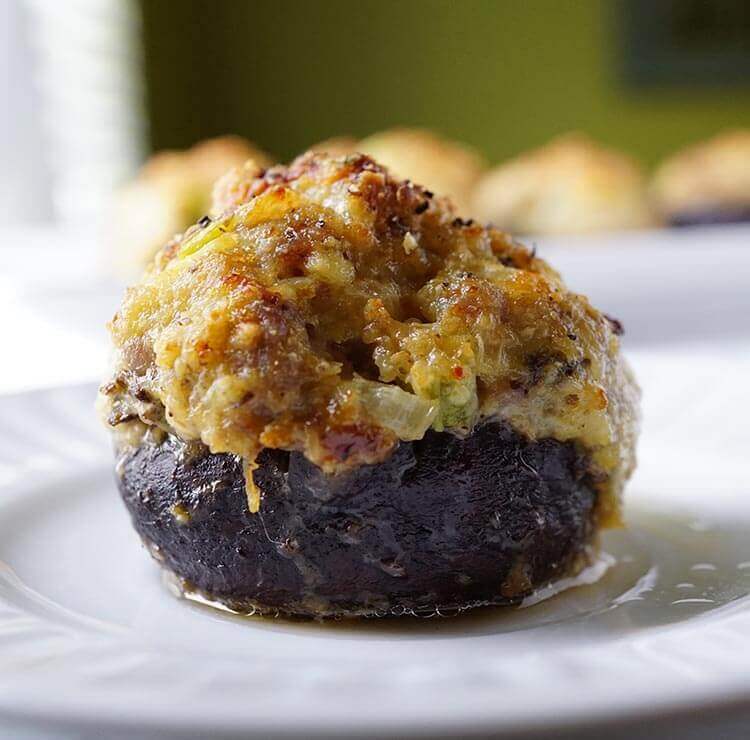 Baked stuffed mushrooms are so flavorful! Don’t you wish you had this fork-full? Love soups and stews? Cozy up with a great bowl of soup click here for a free mini-cookbook! I bet I have you thinking about more easy mushroom recipes that you’re going to love, right? One of my favorites is this recipe for Mushroom Burgers – they are made in the slow cooker and are ooey-gooey, drain down your arm, lick the sauce off delicious! 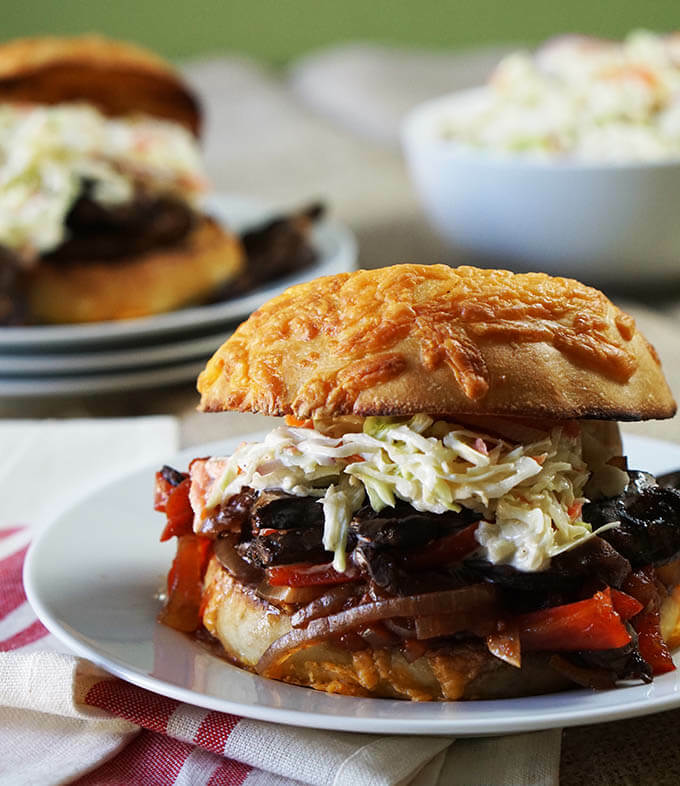 Be sure to bring extra napkins because I promise you – this vegetarian burger is OUTSTANDING! Mushroom Burger – hands down the most fantastic burger (beef, chicken or vegan) that I’ve ever eaten and I’ve done my best since we came home to replicate that burger! Another delicious meal that centers around mushrooms is this simple and easy 30 minute Chicken Tetrazzini Soup! The hardest part about making Chicken Tetrazzini Stew is not standing at the stove, eating it with a spoon! Ok – by now I know I have mushrooms on your mind! 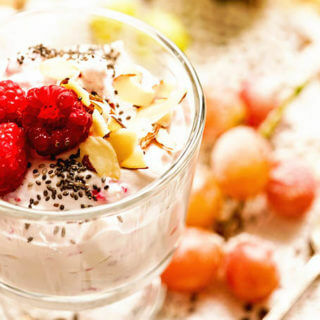 Ok – so tell me, do you love this recipe as much as we do? Leave me a comment below and be sure to give it a five-star rating! This post has been updated from 2015. 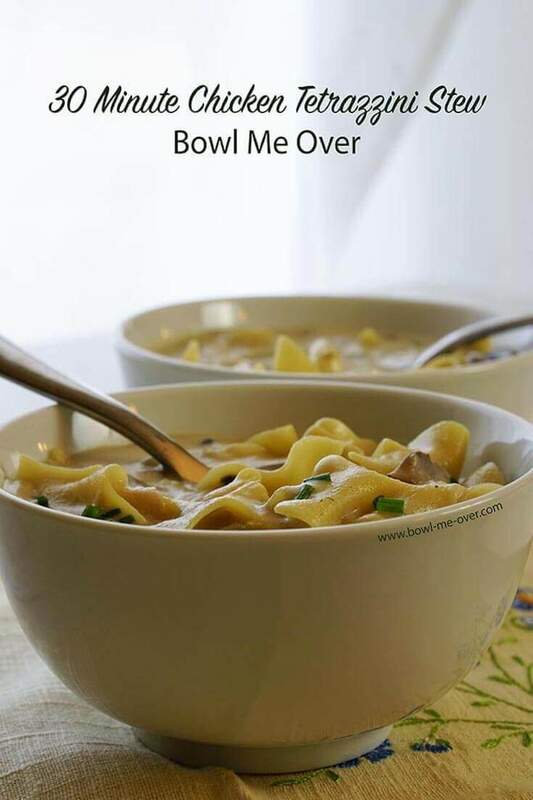 If you make this – tag me on social media with #BowlMeOver I’d love to see a picture of your meal! 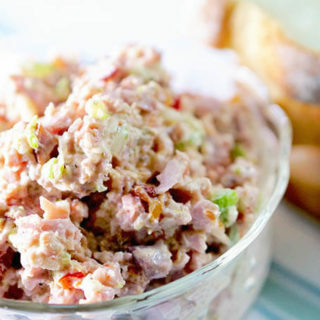 More easy and delicious appetizer from the blog! 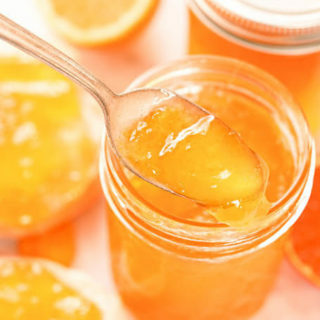 If you’re looking to dive a little deeper and try some different flavors – here is another recipe to try. 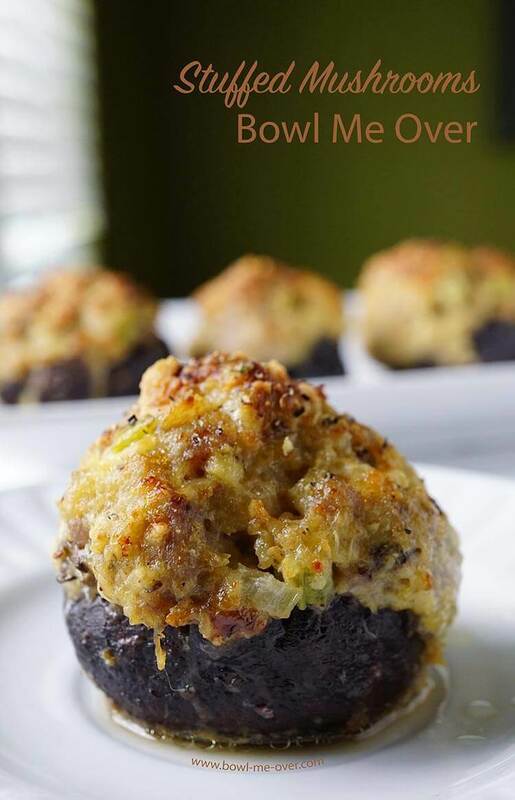 An Affair from the Heart has a delicious and savory – Surimi Seafood Stuffed Mushrooms – stuffed with a mixture of Surimi seafood, vegetables and spices, baked up and served warm. How about a low-carb option? The Foodie Affair has crab stuffed mushrooms without breadcrumbs! The cheese is all melty and fabulous in these Cheesy Rice Stuffed Mushrooms from West by Midwest – Melted cheese stirred into rice with pecans, cranberries all stuffed into tender, fresh mushrooms an appetizer. If vegetarian stuffed mushrooms is what you’re looking for, ead over to Take Two Tapas and grab this recipe for Magnificent Stuffed Mushrooms – Check out this Stuffed Mushrooms with a few surprise ingredients! Baked until golden brown and savory stuffed mushrooms are an easy appetizer. Yes I am looking forward to them. They are soooo Gooooood. Thanks Mom, it will be great to spend some time together! We are really looking forward to your visit!! Thanks Lia, Mom is just the best! Such a wonderful woman, my goal is to be like her when I grow up! 😀 And you’re going to love BOTH of those recipes, the mushroom burger is fabulous also!! You can totally make them Liza! 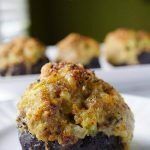 AND customize them too – I love stuffed mushrooms and I’m working on a new recipe also! 😀 Thank you for the wonderful compliment – family is everything, yes!!! They look delish. And Lois IS the best Mom. Lucky all of you. Thank you Michelle – you’re right in that same category as Mom extraordinaire, I’m sure Kristen would agree! I’m not sure why I never think to make stuffed mushrooms! These look delicious.. I want some right now! Then I need to get busy and make another batch! 🙂 Thanks Sarah – I hope you give them a try!! Well, well, well Debra. These sure do look fantastic. And I must admit that I share the same love with mushrooms that your mom does. . .especially when they are stuffed with all kinds of tasty ingredients such as sausage and parmesan cheese. Mushrooms are just the best huh Lynn? 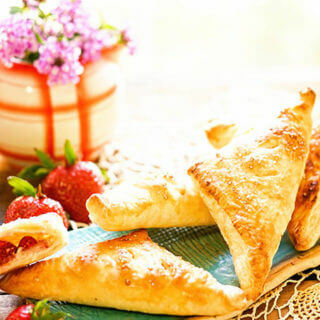 So yummy – you and Mom have great taste!!! 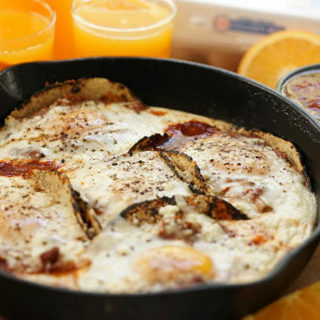 Wonderful, please stop back and let me know what you think – this recipe is one of our favorites! I genuinely love the look of these mushrooms and will absolutely give them a go. Such a lovely post about your folks – I too have a great relationship with my Dad and Step Mum and can’t imagine not having them in my life. That is wonderful to hear Jo, family is the best, thank you very much! Enjoy the mushrooms, I know you really will! I’ve been planning on making stuffed mushrooms for like ever! Thanks for reminding me! I agree with you family is everything! Great, this recipe is for you Julia (well and my Mom 🙂 i hope you really enjoy them!! 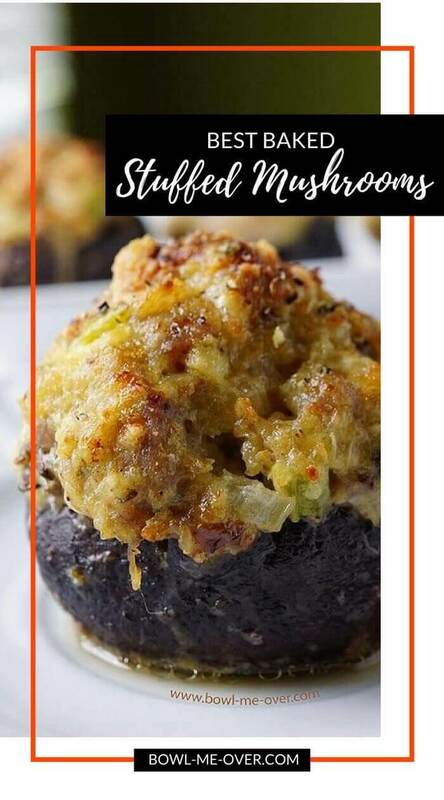 These stuffed mushrooms look absolutely scrumptious! 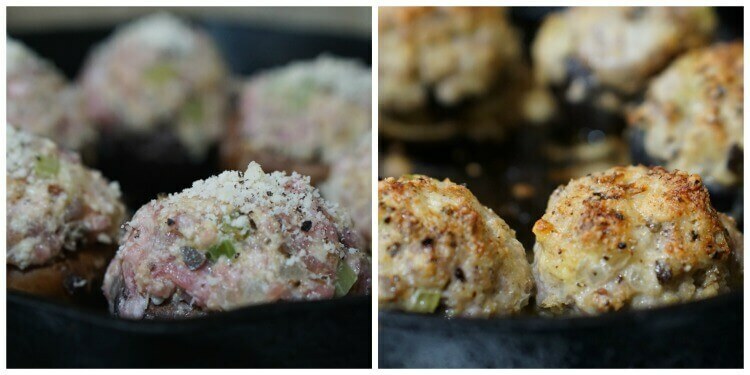 A great recipe for appetizers! We also just made them for dinner!! I’m such a fan of mushrooms! !